"Gems from Genesee River and Wyoming Valley Scenery"
The original design of the Glen Iris grounds by William Webster (See "Ornamental Farm") included this entrance gate. This location of the rustic gate in relation to the Glen Iris can been seen in Image 25. In addition to the gate itself, there are several interesting things. First, you can clearly see the line of trees that Mr. Letchworth had planted along the top of the bank. The trees would have blocked much of the view of the eastern bank of the river. Why would he do that? Here is one possibility. A beautiful forest now covers the far bank of the Genesee. Back then, however, what one would see is raw cut of the Genesee Valley Canal (see Image 117). Although we would love to be transported back in time and gaze upon the canal, it would not have been the natural view that Mr. Letchworth wanted from his front porch. Of course the canal would still have been visible from the rustic wooden benches you can see beneath the trees. Also, there is a bit of mystery regarding the roadway. Note that in Image 25 a dirt lane leads up to and through the gate. In this image the roadway is only found inside the gate! 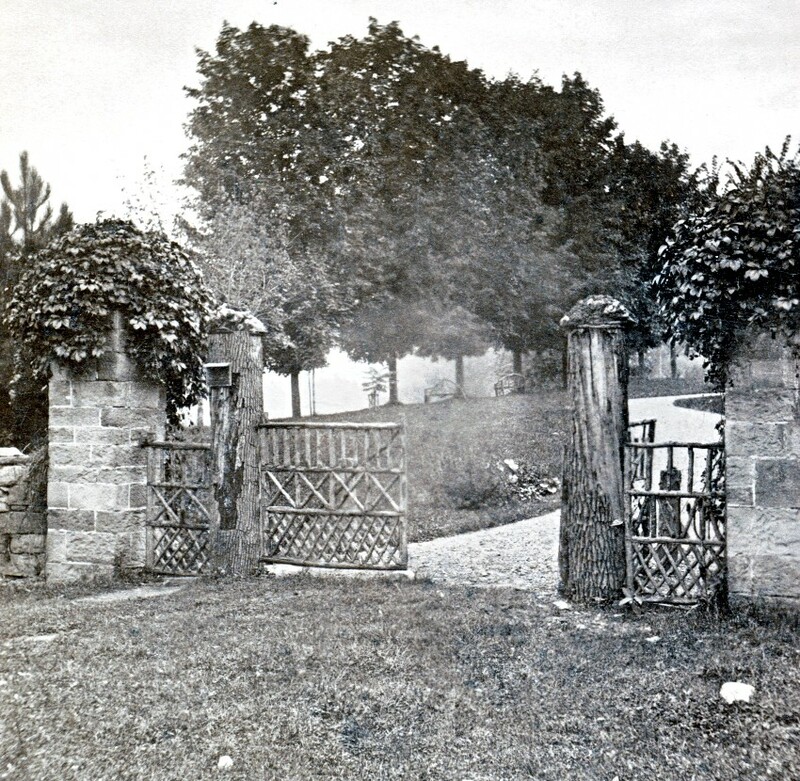 Perhaps this image was taken not long after the gate and stone wall had been erected by Webster as part of his landscaping plan and the road leading up to the gate had not yet been made?